There are two starting points for the hike up Mt. Rinjani, either Rinjani Trek Centre (601m) at Senaru or Rinjani Information Centre (1156m) at Sembalun Lawang. Depending on how much time you have, your fitness and your goals (Crater Rim, Crater Rim and Lake or Crater Rim, Lake and Summit), there are a number of possible treks. Looking at the attached map below, you can see that the options are rather straightforward. Of course, there are superman options where you ascend to the summit and descend without camp. Starting from Sembalun Lawang in the evening, you reach Plawangan 2 Sembalun crater rim after midnight. After a short rest, continue the ascent to the summit for sunrise. Finally, it’s a one long trip back to Sembalun Lawang or even Senaru. A less ambitious variant is to start from Sembalun Lawang in the morning as usual and camp overnight at Plawangan 2 Sembalun crater rim for a 2D1N trip. We planned for a 3 days 2 nights trek from Sembalun Lawang to Senaru, visiting the crater rims, lake and probably the summit depending on how things go on the first day. We chose to start from Sembalun Lawang instead of Senaru so we can summit while we are more fresh and soothe our tired muscles at the hot springs later. 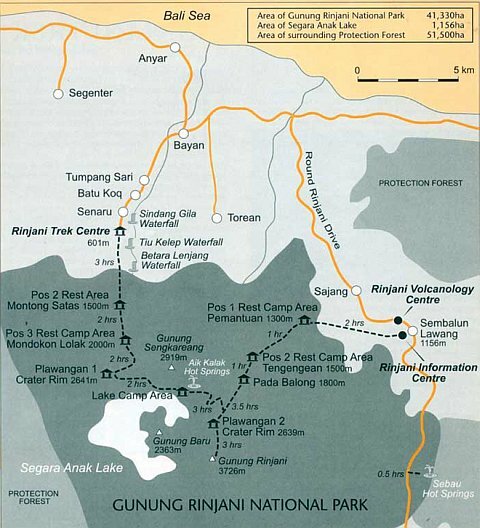 Rough Guide also recommends this route but but for some reasons, Lonely Planet recommends the other route from Senaru. Now that I have completed the trip, I still think that the Sembalun Lawang to Senaru traverse is a better choice. But it’s worth considering a longer 4 days 3 nights trek over the same route for a more leisurely pace. There are many trekking companies. While arranging for the trip, it is important to agree with the trekking company on the inclusions and exclusions to prevent potential misunderstandings. Take note on the number of porters, equipment list, food, transport and accommodations. If you need help organising you trip to Rinjani, take a look at IWT’s 5D4N Mount Rinjani Itinerary. As you can see from my recent trips, we have been working on our fitness with regular hikes to the mountains in Malaysia. If you have hiked Mt. Kinabalu before, I would say that the summit push is similar with regards to the cold wind and steep inclines. Terrain wise, Mt. 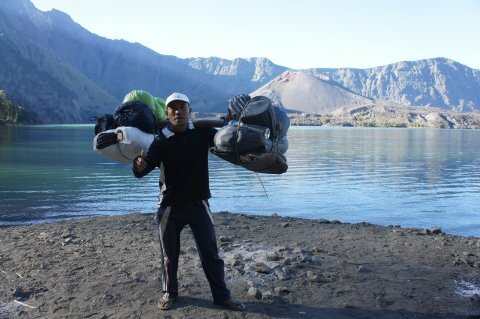 Rinjani is more difficult with its soft volcanic sand. Besides fitness, having the correct equipments are as important. Warm, windproof jacket, gloves, beanie, scarf, headlights and proper walking boots are essential. Some people swear by hiking sticks and I see a lot of people using them so it might be useful.